Drovers roads were the routes for droving livestock on foot to market. Many droveways started in Wales, and the drovers, many of whom came from Wales, accompanied the beasts on foot or on horseback. Sheep, cattle, pigs, turkeys and geese were taken long distances. The drovers used dogs to help herd the animals. The main purpose of country roads used to be for moving beasts, so most of the roads we drive along were made by or for drovers. The ones that are not tarmacked are now byways or bridleways. 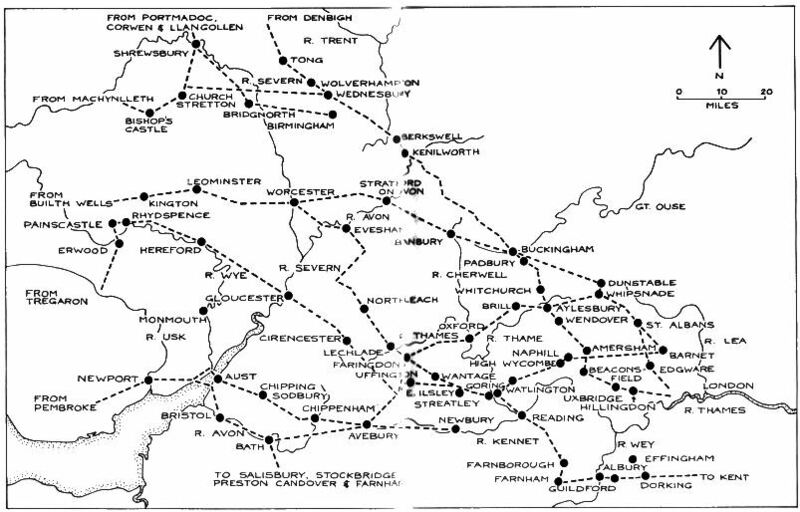 Most have vanished, but there is still a vast network criss-crossing the countryside. These roads were wider than usual roads to accommodate the large herds, at least 40 foot and up to 90 foot wide. There were often long, thin fields parallel to the verges leading the market towns that were used for the same purpose. 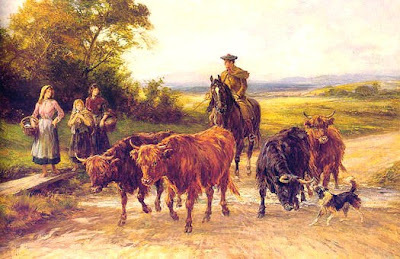 There were many drovers roads out of Buckingham on the way to London, where the animals were sold at Smithfield market. The road from Winslow through Swanbourne was probably a drovers road, passing through to the Stewkley Lane or along the ridgeway towards Mursley, on the way to Leighton Buzzard. The roads through the village are wider than one would expect, for normal use. The inn at Holkham Cottages (The Small Beer Hall) could well have been a drovers inn. There were many inns, where the drovers were used to find hospitality and these were often marked by the Scots pines. In Swanbourne, the old pub that is now Hart House has a Scots Pine at nearby Fir Tree cottage. Also pictures of The Boot from around 1910 show that it too had a pine beside it. The inns were often off the beaten track as drovers were not always welcome in settlements, or at a crossroads where the main road went on and the drovers road diverted to avoid a village. Farmers, however, often welcomed the drovers, making use of the copious amounts of the manure the animals left behind! It was necessary to feed and water the herds to keep them healthy. Cattle for example, needed 8 to 10 gallons per beast per day so roads were often near sources of water. The cattle wore iron shoes, but the geese had boots and ducks feet were dipped in tar to make the journey possible. Drovers roads had high and ancient hedgerows with wide verges where the animals could feed. A local example of this could be Ave (or Hayway) Lane coming in from Granborough. It has all the appearance of a drovers road, and before enclosure, continued straight on to the south of the village, linking up with Stewkley Lane. In the 1851 census, there was one person whose occupation is given as that of a drover. James Carter, aged 44 and born in Swanbourne was said to be married and lodging with John Rose, a pauper and former Carman, and his wife Rosetta and 2 children. Rosetta was actually James’s sister. From the parish records, it seems that he was the son of William Carter, an agricultural labourer and his wife Mary, who also had a daughter named Rosetta. Rosetta Carter married John Rose on 3rd May 1825. However, no record of James’s marriage has been found, and there is no sign of a wife. But if he was a drover, he could have had a wife elsewhere – or else, because all drovers were supposed to be married, he might have invented one! James Carter is recorded as having died aged 48 in 1855, being buried on 26th July. 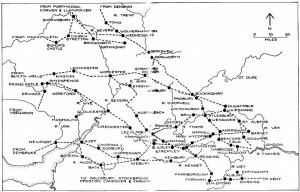 With the building of the railways, it became much easier and cheaper to transport animals by rail, and the practice of long-distance droving died out, though there was still a need for drovers to get beasts to the railway, and to get them to market at the other end of the journey.